'Tis the season to eat. Heartily. Locally. Gluttonously. Thank goodness, it's finally sweater weather, because the amazing dinners in which we've been indulging are seriously taking a toll on my waistline—and the holiday eating is just around the corner. I'm hoping a few layers of wool might hide the results of my recent and soon-to-be overindulgences. My ever-increasing jean size is for a good cause, though. Really. I'm just trying to show my support for local farmers--lending some encouragement, helping ensure the local food scene thrives. Our most recent outing involved an amazing organization, seven brilliant chefs, a dozen local food producers, and a stunning farm—all combining talents to showcase the deliciousness of Upstate South Carolina.
. Live Oak Farms is one of my favorite local farms. Operated by Allison and Chuck Schaum, 80-acre Live Oak Farms not only epitomizes sustainability through the Schaum's commitment to raising heritage breed animals, it also showcases one of South Carolina's most extensive solar panel systems. But Allison and Chuck are not only farmers--they also work tirelessly to educate the community about the benefits of organic, local food. The Schaums provide an outlet for organic farmers to sell their goods to customers through Live Oak Farms' onsite store. Additionally, they lend their expertise to various organizations, such as Hub City Farmers' Market and Carolina Farm Stewardship Association, serving on boards, championing food policies, and aiding local farmers in achieving their sustainability goals. Allison serves on the Board of Hub City Farmers' Market. is a not-for-profit organization that works to increase the demand and availability of healthy foods in Spartanburg County. All proceeds from the dinner benefit the markets' numerous programs, such as community outreach that includes school gardens, a Mobile Market that brings healthy food into communities, and educational events to inspire healthy eating throughout Spartanburg County. Full disclosure: Hub City Farmers' Market is close to my heart. It's where I hang out on Saturday mornings and sell my heirloom plants in the spring. Executive Director Ana Parra is an amazing advocate for farmers and a dedicated leader who has made local, healthy food a reality for Spartanburg County. As is typical for us, Peter and I were late. Some day, in the far off future when the kids are on their own, we may actually arrive at events on time. Maybe. We were greeted at the “barn” with glasses of sparkling wine: Conde de Caralt Brut Cava. The barn is actually a gorgeous event facility—somehow, I don't believe that horses get to live in that much luxury. The chefs were busily preparing the food, talking and joking while ensuring every plate was perfection. Of course, because I was starving—I forgot to photograph the hors d'oeuvres. C'est horrible! Let me assure you—they were gorgeous. And delicious. Until the past year, I've been a snob about rosé wines. But lately, Peter and I have been drinking a happy little sparkling rosé, which convinced me that rosés do not just come out of a \$7.99 cardboard box at fraternity parties. And then—Saturday's Chateau de Nages Rosé was a revelation. A really good, lovely, fruity, not-too-sweet rosé. A grown-up rosé. For most of my life, I did not eat pumpkin. In fact, I thought it was on my most disliked foods list. And then, a miracle—a year ago, at our monthly book club (which is as much about the delicious food shared with friends as it is about book discussions), a friend made a scrumptious pumpkin dip. And I fell in love. How did I live for such a long time without eating pumpkin? The adorably presented couscous was the quintessential taste of autumn. Earthy, spiced perfectly to taste of soon-to-come Thanksgiving dishes, it was one of my favorite treats of the evening. Pair it with pork—how can you go wrong? Sheer deliciousness. Dear Chef Tornatore, could you please come to Thanksgiving dinner—oh, and if you'd like to bring the couscous along, I'm sure we could find a place for it! : savor the flavor, enjoy bites, but don't gorge. Too late. Sadly, I gorged. Dissecting the flavors of the salad, I was amazed at the chef's creation. As someone who fought domesticity for a very long time, I've finally learned to enjoy cooking. Sometimes, I even get wild and—gasp!--don't follow a recipe. Still, how does a chef decide to pair mission fig and blood orange, olive oil and balsamic vinegar to make a delicious reduction? Looking at those ingredients separately would never inspire me to create the beautiful sauce Chef Mathis served. Perhaps this is why I am not a chef. I'm also in awe of Chef Mathis and his amazing energy. We were excited when he opened his Westside restaurant and are frequent visitors to Tee 19. In fact, we spent many meals there during the summer when our kitchen was under construction. Thank goodness for Tee 19! I can't wait to see what project Chef Mathis will pursue next. I don't like sweet potatoes. I know, I know...how can I possibly call myself a locavore if I don't eat sweet potatoes? I've tried them every way imaginable. Baked, roasted, fried. Obviously, I've never tried sweet potato gnocchi. I like sweet potatoes! I do! I like them, Sam-I-am! Really, I could eat sweet potato gnocchi at every meal. But wait--let's not forget the luscious turkey and (don't think about Bambi, don't think about Bambi...) venison. I mean, honestly—is it even fair to serve so much delicious food on one plate? As a fourth course? I think I should have been fasting for a week, and then perhaps I could have savored every bite of this beautiful melody of flavors. I can only wish that our Thanksgiving turkey tastes even a tenth as delicious as what we ate Saturday night. At this point, the size of my stomach seriously rivaled my dinner companion's, who was seated to my right. Her baby is due at Christmas. 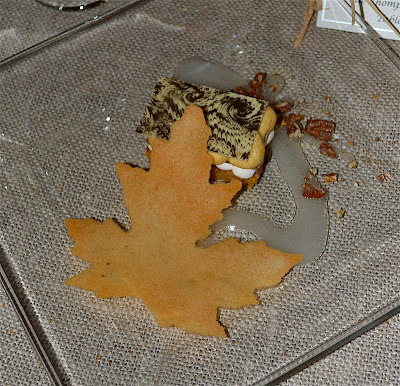 Look at the maple leaf, for crying out loud! Look at the lovely, swirled chocolate and perfectly drizzled sauce! Dear Chef Kaminski, please come live with us. I can't pay you, but I can give you fresh eggs from our hens and veggies from our garden. Does it sound like a good deal? You don't have to cook for the kids, because they don't eat anything, anyway. You can just make this beautiful dessert every day. OK? I have to admit—I passed on the stout. One sip was the perfect pairing with the dessert, but there just wasn't any more room for a big glass of stout. And we all know I'm not going to sacrifice dessert for stout. No eating for a week prior to the Hub City Farmers' Market dinner. Or else, I'm going to embarrass myself and bring doggy bags next year. Cheers to Hub City Farmers' Market, Live Oak Farms, all of the chefs and producers—thank you for a lovely, delicious evening! Can't wait until next year!